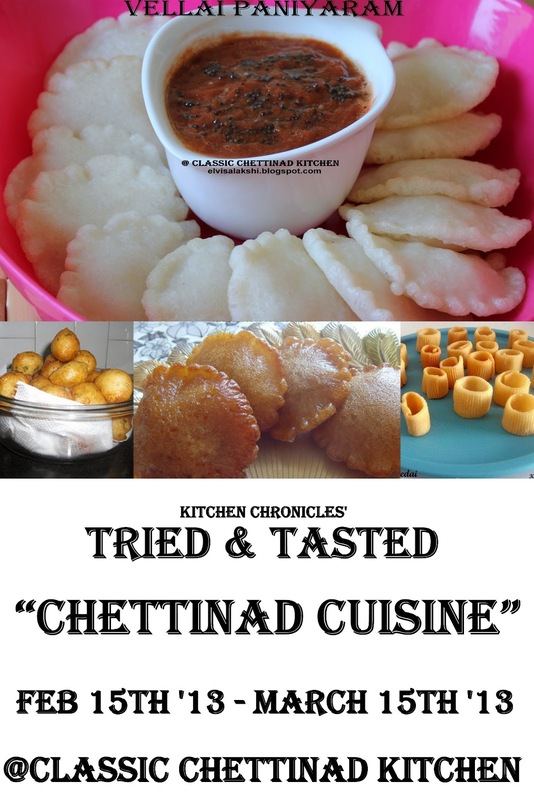 Dear Friends as I had already mentioned in my posts in my Facebook Page for the past few weeks I have been in an effort to revamp my long forgotten event "Tried and Tasted". What is it about? The event is all about bookmarked recipes. There are 1000s and 1000s food blogs and food websites. Each and every site is unique in its own kind. Many recipes are new, some of them old, some of them are presented in a tongue tickling style, some of them have drooling photographs of food, some traditional, some are dedicated to their loving mother, many national and international recipes. Many a times it happens that I start somewhere searching for a recipe or maybe going through someones new post. And from there keep continuing, jumping from one blog to another fully immersed in the recipes, beautiful photographs and so on. And after the end of about 1 hour, I would have bookmarked 100s of recipes. And not only are these recipes bookmarked but several times also "Tried and Tasted". And many a times it happens that we start liking recipes of some particular blog, for many reasons. Firstly because we Tried a recipe from this blog and the 1st time itself we would received a great round of applause from our family members. Sometimes because we like their way of instructions, sometimes because of their tongue tickling photos and so on. 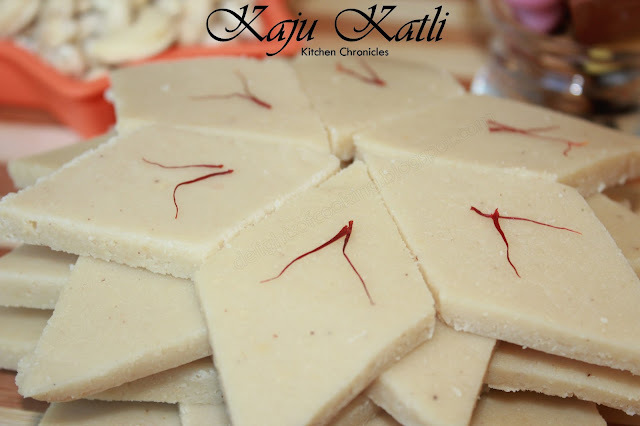 So then we start frequenting this blog, try out many recipes from this particular blog. And so this is the whole idea behind this event. The event "Tried & Tasted" (T&T) is all about appreciating our fellow blogger for their hard work. And how can we honour them for their work? Best way is to try their recipes and letting them know that their recipe had been of great success to us by showcasing their recipes in our blog. And by doing this we will not only appreciate them but also confirm that their recipes are worth it. 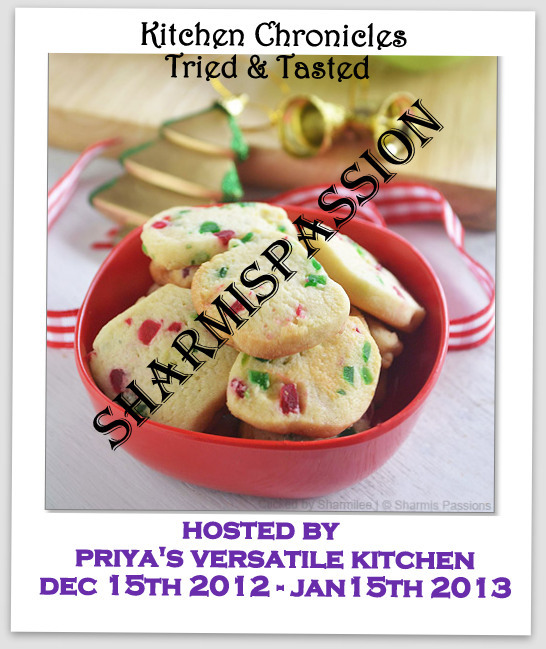 "Tried & Tasted" (T&T) is a monthly event started by Zlamushka of SpicyKitchen and was taken over by me. Every month recipes from one particular blog will be "Tried and Tasted". Tried and Tasted was going on successfully for quiet sometime but then because of lack of time I couldn't conduct it for sometime in between. And now since I am able to find some time for me and my blogs and the event "Tried and Tasted", I would like to get it back going again. So with all your support I started back the event again this month. 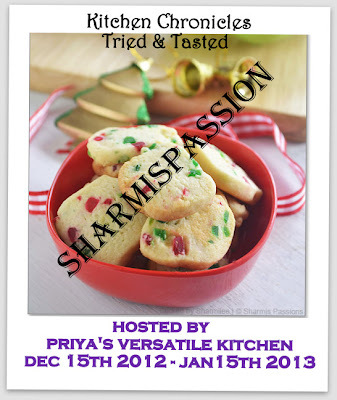 This month the event is hosted by the very famous Priya of Priya's Versatile Kitchen. And she has chosen another beautiful blog which needs no introduction to many of us. 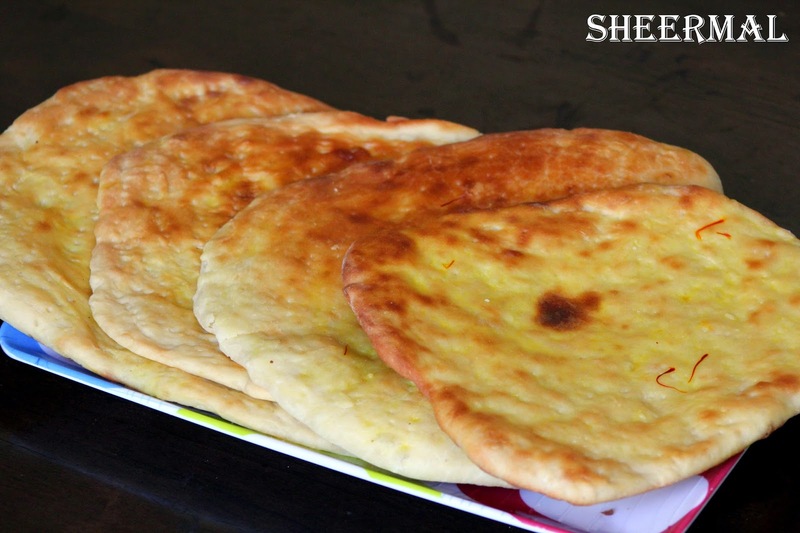 Its Sharmis Passion which has many beautiful photos, healthy recipes, many eggless recipes and step wise instructions. So go ahead folks, prepare as many dishes as you want from Sharmis Passion this month, post it in your blog and link it back to Priya's Versatile Kitchen. For more details about how to link back please refer to her post. Use of logo is appreciated since it helps to spread word about the event. So please I request you all to use the logo. So here is the host line up for the event. I request all my friend bloggers who are interested in hosting the event in the future to leave me a message here as a comment or you can also send me an email with subject "T&T" to venkateshlakshmi7(at)gmail(dot)com. Otherwise you can also leave a message in my Kitchen Chronicles facebook page. This month it is Sowmya of Nivedhanams who is hosting the T&T event. 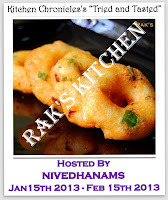 And RAKS KITCHEN is the blog being Tried and Tasted. For more information on the event please visit Nivedhanams. Please send in your entries and make the event a success. Love ur concept and ur write up.U have an intersting blog.happy to follow u.
Lakshmi, nice event, If you want join baking partners, can you mail me at favoriterecipes12(at)gmail(dot)com. I will send you the details.